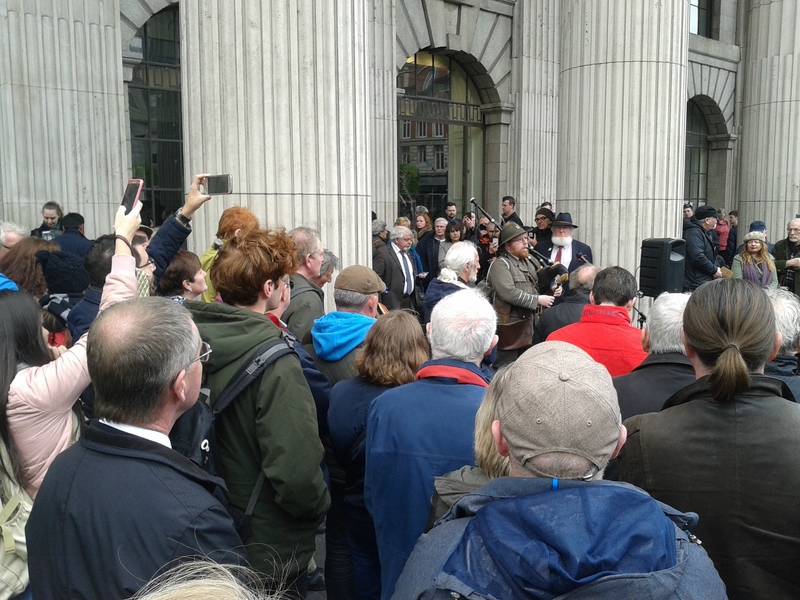 On Monday 25th April people gathered in front of the General Post Office building in Dublin city centre. 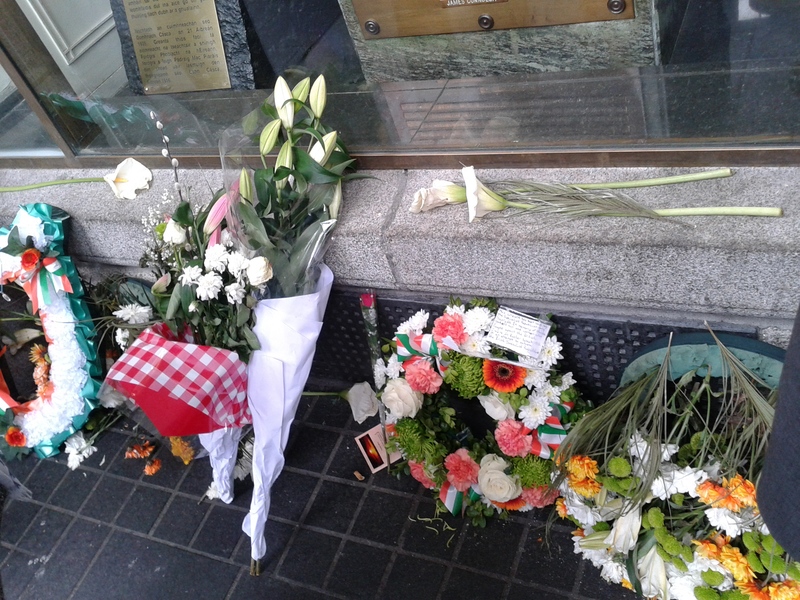 The occasion was the commemoration and celebration of the reading of the Proclamation of Independence by Patrick Pearse outside that same building, shortly after the 1916 Rising had begun under his overall command. 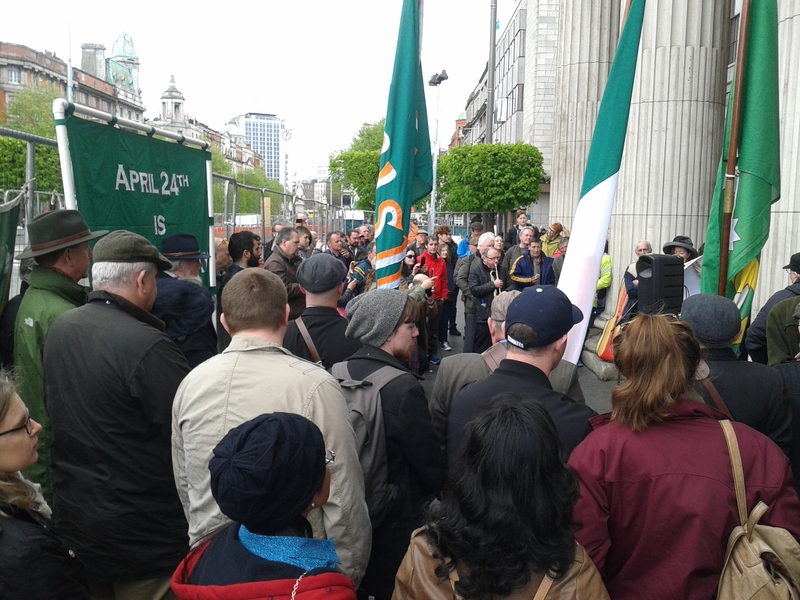 Standing nearby during the reading had been James Connolly, Commandant of the GPO Garrison and also commanding officer of the Irish Citizen Army. Both were executed by the British weeks later for their part in the Rising, along with another thirteen (twelve in Dublin, one in Cork) and months later Roger Casement was tried in civilian court in London and hung. Tom Stokes, who has been a chief organiser of this event since 2010, opened the proceedings, addressing the crowd and the flag colour party. 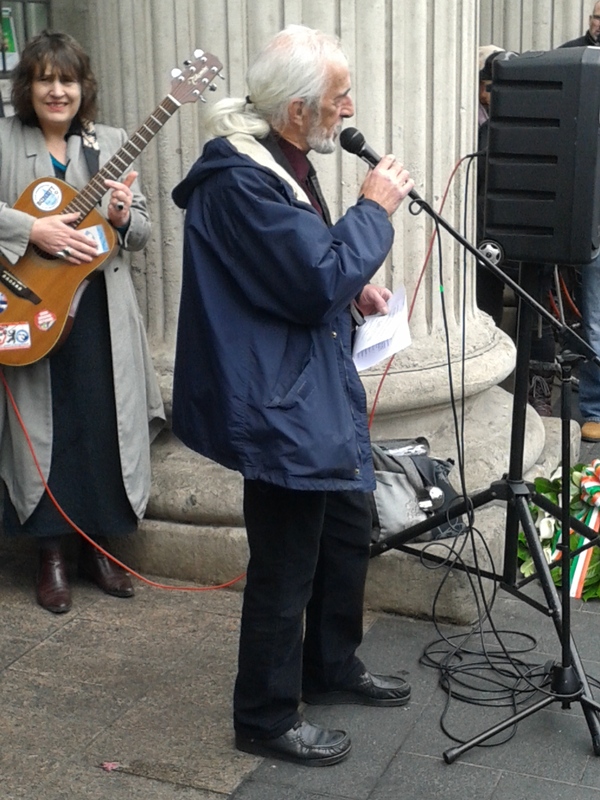 He reminded his audience that in 1917 it had been Republican women who had organised the 1916 commemoration, printing many copies of the Proclamation and pasting them around the city, also defying British military law to gather outside the GPO to mark the events. Among the reasons for this given by Stokes was that many Republican men had but recently been released from British prisons and concentration camps but also that the women had a special stake in the Republic for which the Rising had taken place – they in particular stood to gain from its achievement the status of citizens and many other changes in their status as a result. So it was appropriate, Stokes said, to have women take prominent roles in the event, starting with Evelyn Campbell, who accompanied herself on guitar while singing her compositions Fenian Women Blues and Patriotic Games. Following that, Tom Stokes gave the main oration, outlining his vision of a Republic and castigating the Irish state for what it had produced instead, in particular attacking its treatment of women and declaring that abortion was a private matter in which the State had no right to interfere. 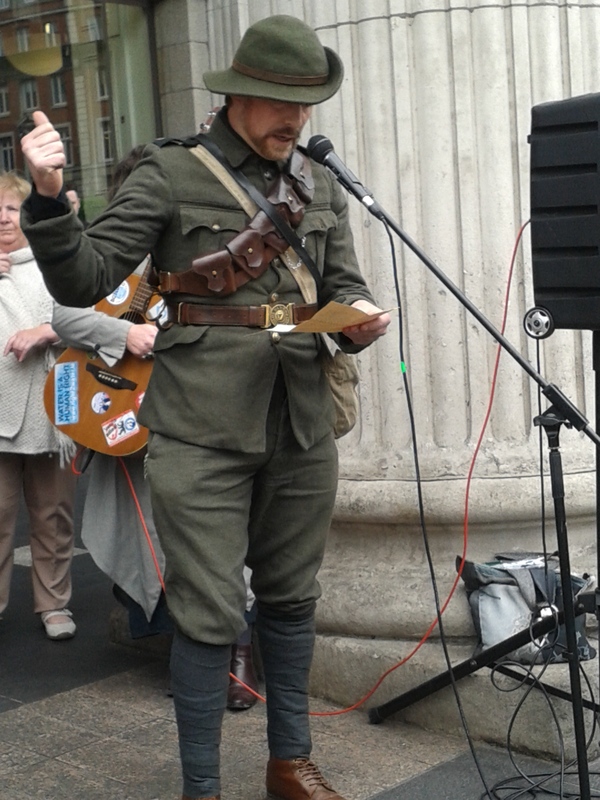 This was followed by Fiona Nichols, in period costume, reading the Proclamation and after that came Dave Swift in Irish Volunteer costume, reading a message given by a wounded James Connolly (he had been injured Thursday of Easter Week by a ricochet in Williams Lane while on a reconnaissance mission). 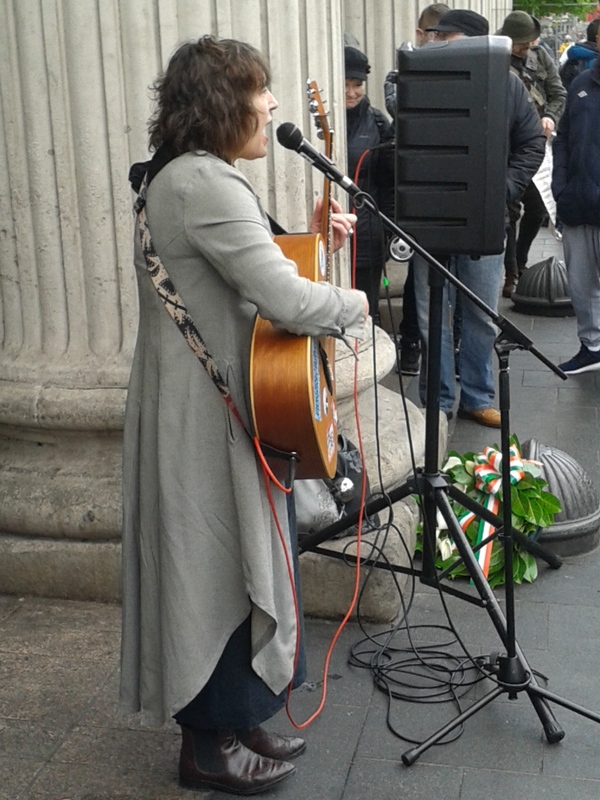 Fiona Nichols reading the 1916 Proclamation. Cormac Bowell, in period Volunteer costume played an air on the bagpipes, Fergus Russel sang The Foggy Dew, Bob Byrne sounded The Last Post on the bugle and Evelyn Campbell came forward again, this time to accompany herself on guitar singing Amhrán na bhFiann. Cormac Bowell playing at the event. Tom Stokes thanked the performers and everyone else for their attendance and said he hoped to see them all again on the 24th April 2018, which will be a Tuesday. 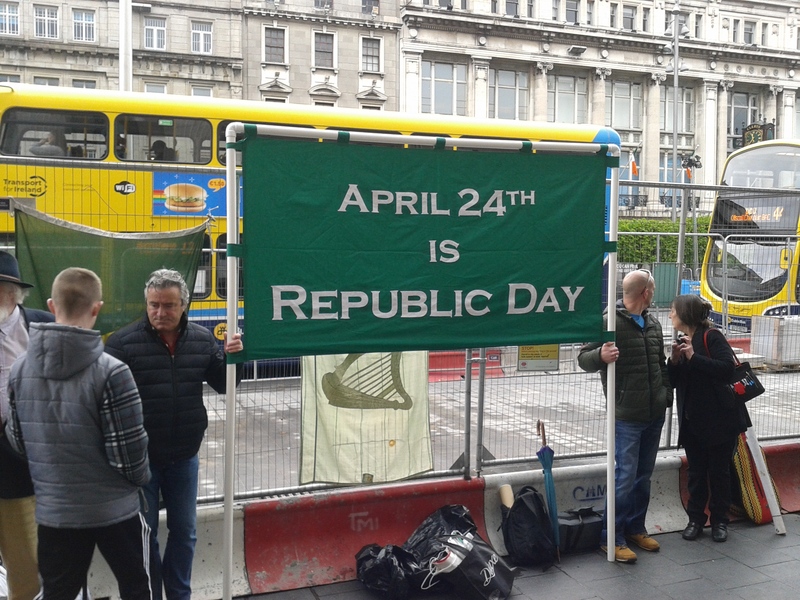 He said it was his wish that this day be an annual National Holiday and they had started the annual celebration because no-one else was doing it. Some of those present marched to Moore Street with a Moore Street campaign banner, taking the GPO Garrison’s evacuation route on Friday of Easter Week through Henry Place, past the junction with Moore Lane and on to Moore Street, where Dave Swift, still in Irish Volunteer uniform, competing with the noise of construction machinery coming from the ILAC’s extension work, read the Proclamation before all dispersed, leaving the street to street traders, customers, passers-by and builders. 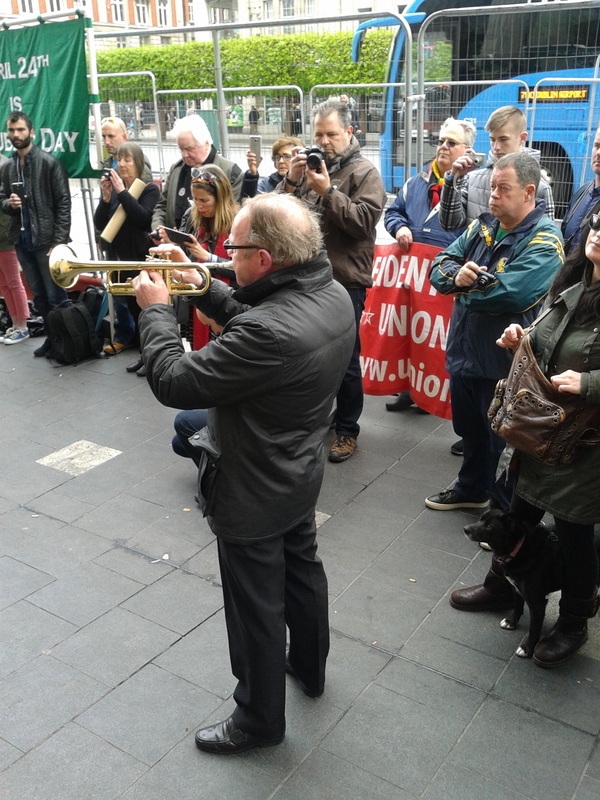 Bugler Bob Byrne sounding The Last Post. This entry was posted in 1916 Rising, Current Event Report, Executions, Gender Equality, History, Ireland, irish history, Irish Republicanism, National Liberation, social commentary, Song and tagged Anti-imperialism, Easter Rising 1916, Gender Equality, Irish history, Irish political song, Irish Republicans, Moore Street, national liberation, social commentary, songs of struggle. Bookmark the permalink. HORROR FASCISTA EN VILLORUELA — BORRADO?